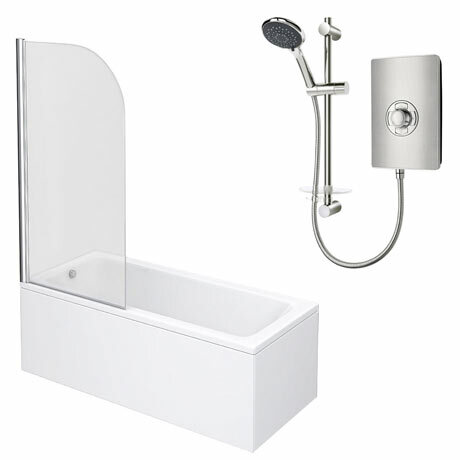 The square single ended shower bath with Triton Aspirante 9.5kw electric shower features a clean minimalist design which will complement any style of bathroom. Bath Tub has been manufactured from high grade acrylic and comes with a leg set. Triton's Aspirante is more than a shower, It’s a statement, Your statement. Brushed Steel has always been a favourite when making a super-stylish design statement. Now this incredible finish effect is available on your shower too. That early morning shower will have never felt so cool. This model is for an 9.5 kw power supply and finished in a stunning Brushed Steel. The bath screen has been constructed from 6mm toughened safety glass with a satin chrome finished hinge. Prevent splashes and spills from the shower causing water damage to bathroom fixtures and fittings. Refresh your bathrooms look with one of our quality shower baths. Tap holes to be drilled to suit by installer. Bath panels & waste not included. "WOW.....where do I start with this package absolutely fantastic bath is great length, width, style, complete with shower screen and a Triton shower just WOW what a bargain thank you so much I am one happy customer guys you have excelled."